New footage of the upcoming game. 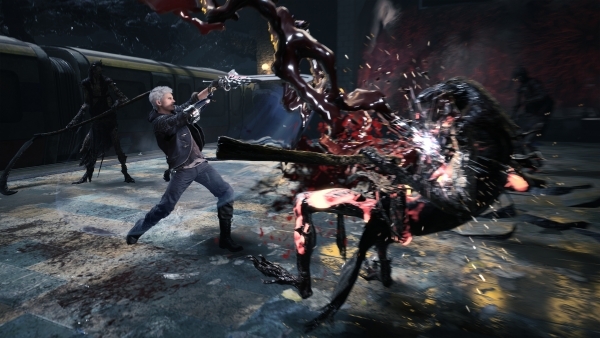 The E3 2018 edition of Inside Xbox featured a new clip of Devil May Cry 5 featuring previously unseen gameplay and an interview with director Hideaki Itsuno. “This is a direct sequel to Devil May Cry 4. It takes place several years after Devil May Cry 4 and Nero has been gifted the neon ‘Devil May Cry’ sign of Dante, which is actually a detail that’s not mentioned in the game, but in a novelization. Nero uses it to set up his own mobile demon-hunting agency, and that’s how our story begins. “You’ll find that there’s a lot of new stuff. But what we can talk about specifically is Nero’s new weaponized robotic arm, which he uses for hunting demons, that we call ‘Devil Breaker.’ You’ll be able to catch a couple of hints as to what they’ll be capable of if you pay careful attention to the gameplay of the trailer, but you can look forward to hearing more details at Gamescom. “It’s been 10 years since Devil May Cry 4, so my boss came to me and said that in order to keep it relevant for today, we’ll need to make something that you can take one glance at and know that it’s quality. So we chose to make it with a photorealistic graphic style. We found, though, that without the proper care, photorealism combined with gaming animation can lead to, what I refer to as, an uncanny valley of action. So we put a lot of effort in to ensure that the game would still play with that tight Capcom play control, but still feel at home with realistic graphics. We’d love for fans to pay careful attention to how that feels.